Apple announced their latest quarter’s financial results yesterday afternoon. In among the headline numbers in the results was the figure for iPads sold last quarter: 13.28 million. Cook also cited statistics that show Apple dominating the tablet market, and the fact that more than half of iPad buyers are purchasing their first tablet. He also touted his company’s newly announced partnership with IBM, which will see Big Blue helping to deploy and support iOS devices in the workplace. Combined with Apple’s “legendary ease of use,” he sees great opportunities for iPad growth in the enterprise. 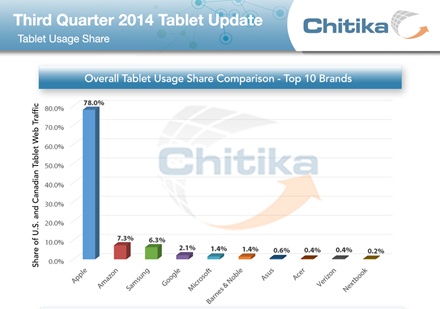 On the same day as the Apple results, the Chitika ad network published their latest quarterly report on tablet usage share. As you can see in the graphic above, the iPad is still dominating in tablet usage share by a huge margin. The iPad’s share is at 78%, and the second place tablet vendor, Amazon, is at just over 7% – so it’s still a massive gap between the iPad and all other tablets. Shockingly, those tablets for doing ‘real work’ on have a usage share of less than 2% – again.